These strange beasts are in the pig family, but unlike your standard porkers they have longer legs and narrower bodies, giving them a more deer-like figure. This is what gives them the name “babirusa” which in Malay means “pig-deer”. They also share a behavioural trait with the local deer, in that they stand unsupported on their hind legs to reach leaves. The most characteristic feature of babirusa is only shown in the males of the species. No, not that – I’m talking about the spiral tusks (although their other male-specific part has a spiral too). These tusks are used in display and fighting, even though they’re brittle. It may even be that breaking an opponent’s tusks is one of the aims of asserting dominance. Most members of the pig family have upper and lower canines that have open roots and which therefore continue to grow throughout the animal’s life, but the babirusa takes this trait to a new level. By flipping the canine alveoli in their upper jaw by 180° they have tusks that grow up through the top of their snout, giving them a very weird appearance. 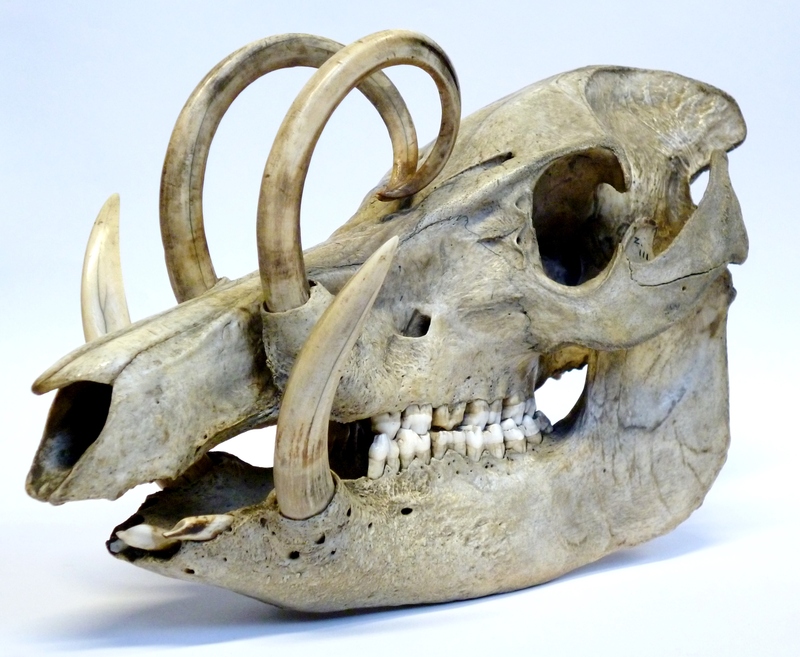 However, there are the occasional reports of babirusa that have a tusk or tusks growing right into the bone of the skull, although this is very rare. 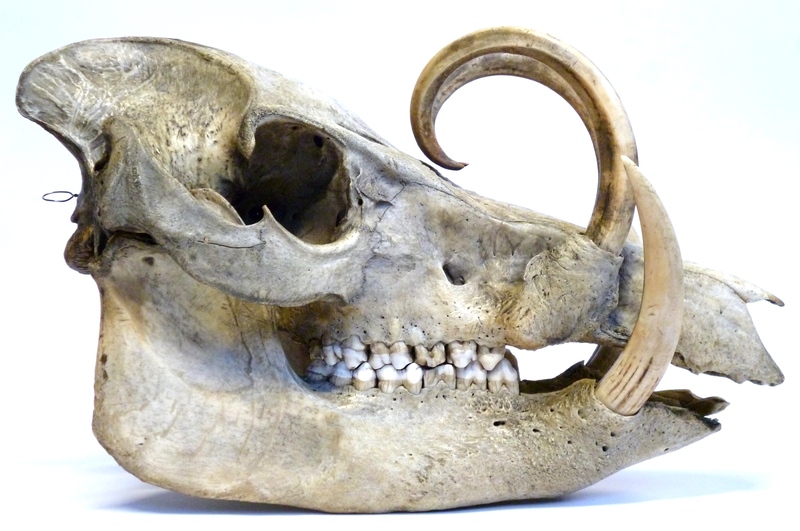 It’s interesting to note that female babirusa skulls are rarely seen in collections, perhaps because they weren’t commonly collected as they lack the tusks (this collecting bias towards males is also common for deer), but I wonder if it may also be because the lack of tusks in the female skulls make them much harder to identify as babirusa instead of pig. This similarity in their skulls is remarkable, considering that pigs and babirusa are separated by somewhere between ten and twenty million years of evolution. In fact, babirusa and pigs are sufficiently similar for them to hybridise, as happened at Copenhagen Zoo in 2006 – although the resulting hybrids are sterile¹. I did wonder if we had a female babirusa in the collection here at the Grant Museum of Zoology, UCL, but so far I’ve not found anything convincing. 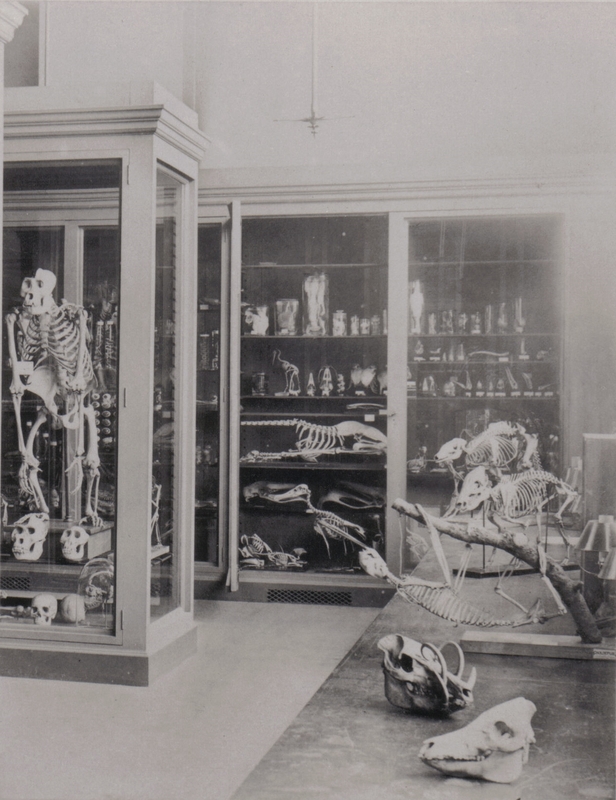 However, there is an image of the Museum from around the 1890s that shows this babirusa skull on display alongside a skull that is either a female babirusa or a female pig, but unfortunately the image quality isn’t quite good enough to tell which. The Museum at the time of Lankester. This isn’t the oldest image of a babirusa though, as it turns out that there are cave paintings in Sulawesi that include a babirusa, which date back around 40,000 years. Interestingly the babirusa depicted is a female, so it seems this bias towards males of the species is a modern – or perhaps Western idiosyncrasy.